At least half of the farms visited by Viva! Campaigns used hobbles (shackles), which are attached to the hind legs of cows to stop them doing the splits – often after they have suffered muscle or nerve damage during calving. This investigation reveals several examples of this common practice, particularly mega-dairy Higher Alminstone Farm which supplies their own brand cheddar to supermarket giant Tesco, as well as Cadbury supplier Mile Elm Farm and ice-cream producer Fairfield Farm. Almost constant pregnancy and lactation, unnatural housing and unnatural feed takes its toll on the over-worked cow. Mastitis (a painful infection of the udder) is often transmitted by contact of the teats with the milking machine and through contaminated hands or materials. It can be treated with antibiotics but milk from those cows is not usable so cows with mastitis that hasn’t become life-threatening are often milked anyway as the allowance for somatic cells (pus) in milk is quite high - up to 400 million somatic cells per litre (EU regulation). This brutal existence can often causes laminitis (an excruciating foot infection), half of the cows in Britain go lame each year and 20 per cent are lame at any one time. Many lame cows continue to be milked regardless of their severe pain. Yet lameness is still the major reason for the culling of dairy cows, accounting for about 10 per cent of culls. Viva! 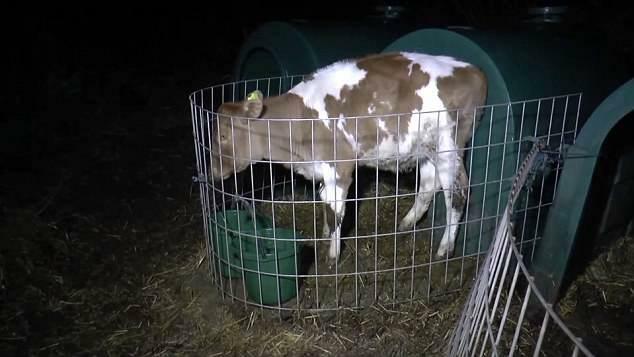 Campaigns’ investigators documented examples of allegedly illegal hutch use at Fairfield Farm, South Devon which makes Aunty Moos ice cream. Calves can be kept in cruel solitary hutches for the first eight weeks of their lives, but registered ear tags proved the calves were four months old. The Welfare of Farmed Animals (England) Regulations states that ‘no calf shall be confined in an individual stall or pen after the age of eight weeks’ unless they have permission from a vet. Viva! Campaigns witnessed large calves desperately trying to reach each other through the wire, hungry for contact and affection. These babies were left alone in these desolate hutches with barely any room to even turn around. Juliet Gellatley describes her first-hand experience viewing such hutches: “Fairfield farm in South Devon, which makes Aunty Moos ice cream, had calves isolated in hutches. That is not unusual but at four months old, these little girls had been there twice as long as the law recommends. They should have been group housed with other calves at two months old unless a vet had endorsed this protracted solitary confinement. Four calves stood in their tiny, fenced-off area outside their hutches, thick with mud and excreta. None had water and they could only just turn around so small was the space. I knelt by one and she desperately sucked my fingers. Mile Elm Farm, Wiltshire, supplies the world’s second biggest confectionery brand – Cadbury. Again we saw rows of hutches, each with a tiny fenced area and each containing a very young black and white calf. One, just days old, was completely alone - a teetering little thing so vulnerable and so beautiful. She latched on to me for comfort, trying to suckle from my fingers. Her mum was just metres away but this baby would never be allowed to suckle from her, never see her again. Is a chocolate bar worth this suffering? At Arla farm in Taunton, Somerset, the calves were again isolated in hutches. Arla is the fourth-largest dairy company in the world whose brands include Anchor butter and Cravendale.” Isolating calves in tiny hutches almost immediately after birth is now common practice and Viva! Campaigns filmed them in use at farms supplying Arla (Cravendale and Anchor brands), M&S and Cadbury. These glorified cages are used to house young calves shortly after they have been torn from their mothers so that the maximum amount of milk can be collected for human consumption. Separation of mother and calf is highly stressful for both – the calf needs to suckle, protection and physical contact and the cow’s strong maternal behaviour is denied. Subsequently, female calves become part of the milking herd while male calves are useless for dairy so will become veal, low quality meat or ‘disposed of’ (shot). Viva! Campaigns’ 2011 investigation into 15 dairy farms that supply Cadbury, contains shocking footage of a baby male calf being callously shot in the head. 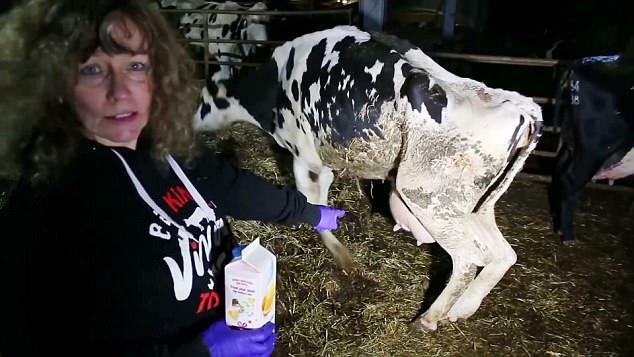 His body went to the local hunt for hound food Viva!’s founder and director Juliet Gellatley, discusses her experience visiting these farms : “This investigation shatters the idyllic image of dairy farming, showing countless examples of emaciated, injured and dying animals. One cow was lying in the straw and I could barely believe it - she was giving birth. Bitter-sweet feelings flooded my heart. Like us, this mother had gone through a long, nine-month pregnancy and here was its culmination - her baby. I felt a wonderful warmth as I was privileged to witness this miracle as the little calf, perfect and beautiful, appeared from her into the world. And then came the nausea - I knew that within a couple of days, her baby would be stolen from her. The awful reality really hit home - the dairy industry is predicated on stealing babies from their mothers. We have no right to do this; it is abhorrent, shameful, disgusting and I will do all I can to expose it. All farms do it – extensive ‘free range’, zero grazing or organic – it is their modus operandi."